Explorer of the Seas, a member of Royal Caribbean’s Voyager Class of ship offers passengers an action-packed cruise experience across a host of destinations worldwide. The Explorer Academy on board allows passengers to acquire new knowledge and skills while at sea. Passengers have the opportunity to witness cookery demonstrations, attend guest lectures, participate in dance classes and much more. Why not try out the latest innovative feature of Explorer of the Seas? FlowRider is a surf simulator which allows passengers to catch some waves from the comfort of Explorer of the Seas. 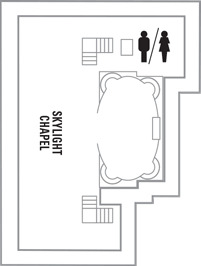 There is also a climbing wall, ice skating rink and mini-golf course, ensuring that there is always a host of exciting activities awaiting. As expected with a Royal Caribbean ship, Explorer of the Seas is home to a wide selection of dining options. Passengers can enjoy multiple courses for breakfast, lunch and dinner while aboard. Guests can sample a wide variety of international cuisine, such as Italian at Giovanni’s Table or Japanese at Izumi. After dinner, there are numerous entertainment options for guests including a Vegas inspired Casino, Broadway inspired theatre and 15 clubs, lounges and bars. Day or night guests will never run out of activities. 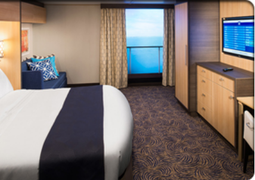 The Explorer of the Seas offers a range of great accommodations to suit the needs of everyone with Inside, Outside, Balcony cabins and luxurious Suites on offer. Each stateroom has the highest standard of decor and is designed for your comfort to insure you feel right at home while sailing on board. 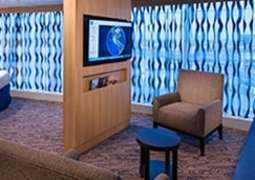 Explorer of the Seas has 26 wheelchair accessible cabins. On board you’ll find an exquisite variety of specialty restaurants, bars and cafés. Dine in the classic 50s-era Johnny Rockets diner or in the classy Giovanni's Table restaurant, home to the finest Italian cuisine and why not try Explorer of the Seas signature steakhouse 'Chops Grille'. In case you don’t feel like dining until later in the evening, sit and have a coffee and pastries at Cafe Promenade or the Windjammer Cafe. Room service is on offer around the clock if you decide to dine in your cabin. Explorer of the Seas takes no shortcuts when it come to entertainment on board. One highlight of the Explorer of the Seas is the 3-story theater, in which you will find spectacular musicals and performances from well-known artists. You are also invited to test your luck with a round of blackjack, roulette and much more in the Casino Royale, shake a leg in the DJ Nightclub or relax in one of the numerous, differently themed bars. Activities on board are endless with ice skating, 9-hole mini-golf course, full sized football field for all types of sports, basketball and volleyball are only a few of many activities Brilliance of the Seas have to offer. Along with this there are family fun activities including contests, enrichment classes and a video games arcade. For young children during the day there is a Royal Tots programme so your child can make new friends on board and also a Adventure Ocean youth programme for the older children to explore and enjoy all the ship has to offer. A fitness centre with state of the art equipment, including a range of classes from yoga to tai chi and don't forget about the outdoors were you can climb to new heights on the climbing wall or enjoy a relaxing jog on the jogging tracks. While if you prefer to relax indulge in several of the exquisite treatments on offer in the Vitality Spa or take a swim in one of the four pools on offer for you while your family can relax with you and enjoy an movie with the outdoor poolside movie screen. The spacious Royal Promenade spans over four decks and offers a variety of shops including jewelry, apparel, perfumes, shopping for teens and eateries. The Explorer of the Seas offers a great array of state of the art technical equipment needed for conferences and events. Your adventure aboard the MS Explorer of the Seas begins right here as you learn about the enchanting beauty of her many restaurants, bars, clubs, shops, sports activities, relaxation areas, destinations and much more. Since 2000 she has been giving pleasure to passengers from all over the world, taking them to exciting locations across the Caribbean, Central America and North America (including the East Coast of the United States). Part of the Voyager Class of ships operated by Royal Caribbean International, she was built in Turku in Finland like the others in the class and includes a unique laboratory for the study of oceanography used by the Rosenstiel School of Marine and Atmospheric Science of Miami in the United States. On board the MS Explorer of the Seas you should go ahead and “explore” the different places to eat and indeed it will be quite the adventure as there is so much to choose from. No matter what kind of diner you are whether you prefer it more casual, eat only meat or like vegetarian and healthy options, everyone has been accounted for. To begin with the Main Dining Room forms the self-explanatory main dining area where you can sit down and eat at any meal of the day and choose from delicious multi course menus. However for a more casual atmosphere you should go to the Windjammer Café where there is a wide selection of food from all over the world, including appetising pasta, soups, meat dishes, sandwiches and food made to your specifications too. Jade Sushi is a brilliant place to try out delicious sushi and other Asian dishes including fusion dishes for a more healthy diet. Make sure you visit Portofino where you can sample the delights of fine Italian dining and have an excuse to dress up smartly. There is a small charge for the Portofino dining experience but this is a small price to pay for the amount of pleasure it gives to each and every guest who comes to visit. Go the extra mile and explore any number of activities available to you aboard the MS Explorer of the Seas. There are many complimentary activities to so do not miss out! Come try out the climbing wall which reaches 40 feet into the sky above deck and gives a brilliant chance to escape the hubbub below into an exhilarating yet peaceful view of the sea. For an activity that’s fun for the entire family try out the ice skating rink or the mini golf course. However for activities just for the kids, there are various activities which they can partake in such as Royal Babies® and Royal Tots® sessions (ages 6 months to 3 years) where they can learn as well as play under supervision. Then for older teens there are areas dedicated solely for their leisure where they can hang out, play video games and have their own discos. For an absolutely unforgettable night go down to the various bars and clubs which include themed bars and pubs for a night spent how you want it whether it be a relaxed pub session or a fun night of dancing. Try the Casino Royale® which stretches as far as the eye can see with endless slot machines and various games tables where you can play different card games. For a choice of different relaxing and other beauty treatments go to the VitalitySM Spa including facials, massages, Botox and acupuncture as well as special treatments just for men and teenagers. Royal Caribbean’s Explorer of the Seas is part of the cruise line’s Voyager Class. She is a staggering 310.9 metres long and 48 metres wide. As for guests, she can comfortably fit an impressive 3114 passengers! Thrill seekers will be in heaven aboard Explorer of the Seas. Enjoy a spot of rock climbing on top deck and feel like you are climbing right into the sky. Or book yourself in for an ice-skating lesson and then spend a well-deserved afternoon of relaxation by one of the ship’s ten pools and whirlpools. Other sports options include an ice-skating rink, a mini-golf course, a basketball court and jogging and In-line skating tracks. For the young’uns there are kids’ pools as well as a complimentary Adventure Ocean Youth Program, a Royal Babies and a Royal Tots program, and teen lounge areas and discos. 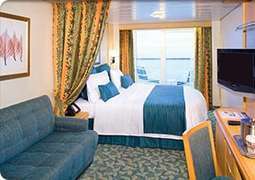 Some of the cabins aboard Explorer of the Seas offer inward-facing views onto the famous Promenade. These cabins are great for those who want to look out onto the action and see what everyone is up to. 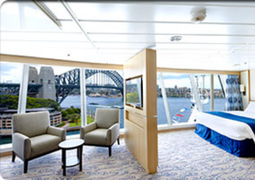 Balcony cabins are a more relaxed alternative. The luxury suites are also especially serene and elegant. The aforementioned Royal Promenade is the heart of Explorer of the Seas. Full of cafes, diners and shops, it resembles an all-American shopping mall. A good place to while away a few hours! Stroll along the Promenade with a milkshake or an ice cream and pretend you are in a movie.